Description: Students will use museum collections to better understand Clara Barton, president and founder of the American Red Cross, her life and experiences at her Glen Echo home, and the role of preservation in telling her story. Compare and contrast a modern first aid kit with Clara Barton’s actual first aid kit. 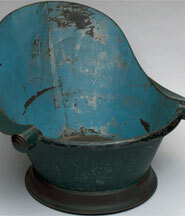 Examine images of historic objects together with background information [appendix C] to prepare for remaining lessons. Skills: Students will work in small groups and analyze data by comparing the two first aid kits. Lesson Two: Tracking the life of an object. –Students complete the How to Read an Object Chart using object images and similar items. Students “catalog” the objects. Skills: Students deduce and evaluate the data obtained from group activity. Lesson Three: Agents of Deterioration-Students complete agents of deterioration worksheet to recognize, and understand their impact on museum collections. Skills: Students study and analyze the impact of the environment on collections. Lesson Four: Scientific Experimentation and Observation-Students complete experiment on the impact of moisture of objects and an exercise in studying and identifying common museum pests. Skills: Students observe firsthand the impact of the environment and other chemical and natural hazards on collections. Lesson Five: Create a exhibit with the class-Students design an exhibit using the object images and prepare a press release. Skills: Students, in small groups, research and write exhibit text and a press release. What role has preservation played in the history of Clara Barton National Historic Site? An object that represents teacher’s personal heritage, such as a family bible or a grandfather’s walking stick. Natural environments may contain substances (for example, radon and lead) that are harmful to human beings. Maintaining environmental health involves establishing or monitoring quality standards related to use of soil, water, and air. When an area becomes overpopulated, the environment will become degraded due to the increased use of resources. Causes of environmental degradation and resource depletion vary from region to region and from country to country. Human activities also can induce hazards through resource acquisition, urban growth, land-use decisions, and waste disposal. Such activities can accelerate many natural changes. Risk analysis considers the type of hazard and estimates the number of people that might be exposed and the number likely to suffer consequences. The results are used to determine the options for reducing or eliminating risks. Students should understand the risks associated with natural hazards (fires, floods, tornadoes, hurricanes, earthquakes, and volcanic eruptions), with chemical hazards (pollutants in air, water, soil, and food), with biological hazards (pollen, viruses, bacterial, and parasites), social hazards (occupational safety and transportation), and with personal hazards (smoking, dieting, and drinking). NL-ENG.K-12.7 Evaluating Data: Students conduct research on issues and interests by generating ideas and questions, and by posing problems. They gather, evaluate, and synthesize data from a variety of sources (e.g., print and non-print texts, artifacts, people) to communicate their discoveries in ways that suit their purpose and audience. NL-ENG.K-12.8 Developing Research Skills: Students use a variety of technological and information resources (e.g., libraries, databases, computer networks, video) to gather and synthesize information and to create and communicate knowledge. Later, Barton worked at the U.S. Patent Office in Washington, DC. During the Civil War, Clara Barton saw many soldiers come through the city, some wounded or in need of supplies. She began a collection of goods and supplies to give to the soldiers. But this only did so much good. Clara Barton knew that to provide any real support or services she needed to be closer to the battle, on the field. But because she was a woman, this was not an easy task. However, her persistence and courage eventually allowed her to gain permission to go to the battlefront. She pushed herself hard during the war, working to help all those in need no matter what side they were fighting for. After the war, Clara Barton organized a search for missing soldiers, attempting to reconnect families with loved one, or at least give them a sense of closure. After all of her hard work, Miss Barton’s doctors recommended that she take a much needed rest, a holiday in Europe. Not be one who was used to being idle, Clara Barton soon found a new cause. She learned of the International Red Cross and their work all over Europe. Coming back to the United States, Clara Barton brought the idea of an American Red Cross to the US government. But the United States had just fought a war, and did not think another would come along anytime soon. They had no interest in supporting an organization for victims of war. So Clara Barton amended her plan to include victims of famine and natural disasters, none of which were preventable. Clara Barton became the first president of the American Red Cross in 1881. Clara Barton was drawn to Glen Echo by Edward and Edwin Baltzley. The two brothers were developing the area around their Chautauqua in Glen Echo. They knew that having a person of national celebrity in the neighborhood would draw buyers to the area and offered to build Clara Barton a house free of charge. She accepted their offer, but she first used the building only as a warehouse. The house was too far from Washington, DC to be very practical. It took her over two hours to reach Glen Echo by carriage. However, when the trolley lines came to Glen Echo in 1897, she moved into the house full time. The house functioned as her home, warehouse, and national headquarters for the American Red Cross. Clara Barton sent teams, often including herself, of volunteer aid workers to disaster sites. These teams were stockpiled with supplies and a desire to help. "Visit the worst places, stay long enough to learn the real needs, and supply them... This is the original style and spirit of real Red Cross work." Miss Barton remained the president of the American Red Cross until her retirement 1904. Following her career as president of the American Red Cross, Clara Barton established the National First Aid Association of America and served as the honorary president for five years. The organization emphasized basic first aid instruction, emergency preparedness and developed first aid kits. Clara Barton died in her Glen Echo home of double pneumonia. She was 90 years old. After Clara Barton’s death in April 1912, the house was left to Dr. Julian Hubbell, Miss Barton’s former chief field agent, who after some legal troubles which caused him to temporarily lose the home to a Mrs. Mabelle Rawson Hirons, passed it onto his nieces, Rena Hubbell and Lena Hubbell Chamberlain in 1929. They turned the home into a boarding house with private apartments which they sold to a Mrs. Josephine Franks Noyes in 1942. Mrs. Franks Noyes along with hers sisters worked to re-coup some of the lost furnishings and items belonging to Miss Barton sold by Mrs. Hirons and began the work to establish the home as a memorial. This in turn lead to formation of the Friends of Clara Barton, Inc. who purchased the home from the remaining Franks sisters in 1963. These individuals worked throughout the 1950s and 1960s, the home was declared a National Historic Landmark in 1965 and eventually designated a National Historic Site in 1974. It was transferred to the National Park Service in 1975. It is due to the efforts of this large and varying group of people that many of the original furnishings were kept and/or located. In fact one-third of the museum collections are original to the site. The Park Service worked to restore the house to its state as it was in the 1890s/1900s when Clara Barton lived in the house with Red Cross workers and volunteers after the transfer. Former boarding house apartments were converted to exhibit spaces which showcase her bedroom, red cross offices and volunteer guestrooms. Since the site was declared a National Historic Site, its museum has been formally accredited by the American Association of Museums due to its museum and educational programs. Accreditation: a process of internal staff review and external peer evaluation of an institution's standards of management and program operations. American Association of Museums: A national organization representing the museum community. Artifact: artifact or object is a human-made or used item that gives information about the culture of its creator and users. Collection: a group of objects gathered for study, comparison and exhibition. Conservation: the treatment of an object to return or enhance its chemical or physical stability; uses interventive methods. Conservator: a specialist, educated and trained in the preservation and treatment of physically or chemically unstable objects. Cataloging: the process of creating a record for an object that includes giving it a unique catalog number, description and location. Curator: a specialist educated in a particular academic discipline relevant to the repository/museum's collections and trained in collections care and maintenance. Datalogger: an electronic device that records data over time or in relation to location either with a built in instrument or sensor or via external instruments and sensors. Historic Preservation: Historic preservation or heritage conservation is a professional endeavor that seeks to preserve, conserve and protect buildings, objects, landscapes or other artifacts of historic significance. Integrated Pest Management: is a decision-making process that helps you determine if, when, and where you need pest suppression. Infrared Light (Lux/Lumen): this type of light lies between the visible and microwave portions of the electromagnetic spectrum. Museum: an institution dedicated to the care, study and display of objects. National Historic Landmark: A National Historic Landmark (NHL) is a building, site, structure, object, or district, that is officially recognized by the U.S.Government for its historical significance. All NHLs are listed in the National Register of Historic Places. National Register of Historic Places (National Register): The National Register is the United States government's official list of districts, sites, buildings, structures, and objects deemed worthy of preservation. Relative Humidity: the amount of water vapor in the air, described as a percentage of the maximum amount of vapor the air can hold. Ultraviolet Light (UV): is electromagnetic radiation with a wavelength shorter than that of visible light. Unit Preparation: The goal of this unit is to learn about the life of Clara Barton through the museum collection. This unit also stressed practices of conservation and preservation, specifically within the Clara Barton National Historic Site. At the end of this unit, students will have researched and analyzed the life of Clara Barton using the museum’s collection. They will also have a fundamental understanding of museum practices such as conservation and preservation. These five activities are meant to build off of each other. We recommend that you complete all five in order. Divide the class into 10-15 groups (about 3-4 students in each). Each group will be in charge of researching and examining one object from the collection. 15 object images and associated text are provided. Use as many objects as you have groups for. Make a copy of the text associated with each object for every student in the class (see Appendix C). Make the object image .pdf file available to all students via computer and/or projector. If not possible, print off one copy of the image file per group. Each group will need a copy of the How to Read an Object chart available on the Teaching with Museum Collections website and the Catalog Card form (see Appendix A). They will also need access to the images. Each student will need a copy of the Agents of Deterioration worksheet (Appendix B) and the object text (see Appendix C). Organize students into groups of 3-5 with a pen/pencil and paper. Introduce students to Clara Barton and her work as founder and first president of the American Red Cross using one of the first aid kits she developed (CLBA 1519-1543, see Section C and image .pdf and Appendix C for more information on the First Aid Kit). Students will compare Miss Barton’s First Aid Kit to a modern kit and note their differences in their assigned groups. Discuss the origins of first aid before being introduced formally to Miss Barton and the items she used such as the first aid kit that were so vital in her work before moving on to the next activity. Provide each group with a copy of the object text (Appendix C) and a copy of the object image .pdf (printed or electronic).Inform students that, for the final lesson, will create an exhibit around the theme Clara Barton: A Lifetime of Service. Review and discuss how these 15 historic objects represent her life and work through time; from her field work during the Civil War, service as president of the American Red Cross, and experience creating the first First Aid Kits. Through these objects, construct a well rounded story about Barton’s life that in an exhibit to be created in Lesson Five. Tracking the life of an object. Provide each group with a copy of the How to Read an Object chart and Catalog Card (see appendix A) and one of the similar items listed in the chart in Section C of this lesson unit plan. Assign one object image and one locally obtain object that is similar to the museum object, and a scribe to each group. Have students compare items and answer the questions on the chart, to explore use, materials, etc, and what they tell us Barton’s life? Groups assume the role of a museum curator. [a curator is responsible for the to make sure that museum collections are cared for, documented and protected and preserved. The curator uses a Catalog Card for each object to document and track collections. Students will fill out a Catalog Card using information collected in the previous activity and from close observation. Provide each group with: construction paper, a spray bottle, a scrap of fabric, a piece of plastic, and a section of wood along with the their pest forms. There will need to be a follow up session for the first activity to observe results. Temperature: large fluctuations in temperature are not good for an object. Excessive heat may speed up the deterioration process. Extreme cold may cause the materials to become brittle and break easily. Humidity: excess humidity in the air causes mold and mildew growth, which grow more easily in a damp environment. It also may cause materials, such as wood, to expand and then contract. This expanding and contracting over time may cause an object to become warped and misshapen. To monitor for temperature and humidity, we place small devices called dataloggers throughout the museum that read the air temperature and the relative humidity. This way, we always know if the temperature or humidity is becoming too high or too low. Pests: Bugs, rodents and other pests can cause damage. Monitoring help us know what types of bugs (or other animals) are in the museum and how to eliminate them. They are attracted to a museum collection for one reason, to eat it! To keep track of pests, we place small numbered traps in strategic places through the museum and office spaces, usually by doors and windows where pests could enter the building. These traps are made of paper and have a very sticky surface to them. If a bug is caught, we are able to identify what type of pest it is and generally when it entered the museum, as the traps are checked on a regular basis. To track the data collected from the traps on a monthly basis, the information including pest type and trap location is entered into a database where the data can be assessed. If there is a large increase in a certain type of pest, then you know you have a pest management problem. Light: Light, both ultraviolet (UV) and infrared that enters the building through treated and untreated windows and open doors is damaging. It causes brittleness and color loss. Items as wooden furniture or fabric curtains are damaged by exposure to harsh UV light. To monitor light we use ELSEC monitors which measure the UV and Infrared light in selected museum exhibit spaces monthly to study any changes and measure the effectiveness of tools used to mitigate light damage. Windows with a small layer of film designed to protect museum collections from further exposure to UV light. Students use these two exercises to see first-hand the damaging effects of humidity and pests on materials that are typically used in a museum exhibit. Humidity: Liberally spray the paper, plastic, fabric and wood with water and let it sit. Observe results as the materials dry. For example: Does the paper lay flat? Does the fabric wrinkle over time? (Allow items to dry over a period of 24hrs) Note your observations in a scientific journal. Please note how much water was used on each object and how long it took to dry in your journal. Pests: Using the descriptions given in the Common Museum Pests Form (Appendix D) can you identify through observation the common museum pests endangering the museum collections on exhibit on the worksheet, ”A Bug Adventure in Clara Barton’s Front Parlor,” (Appendix E). Pests are monitored in the museum through a series of traps in a process called Integrated Pest Management. The data collected is studied to determine the best method of removing pests from the museum. If left unchecked and untreated these pests have the potential to irreparably damage museum collections. Print off photos and mount object images in the display area. They can be tacked to a bulletin board, or on table display stands. Students will research, write and develop object labels within original groups. Each group also write a general narrative on Barton’s life of service, see sample below). Prepare a press release summarizing your exhibit to distribute among other classes. Include information such as details about Clara Barton and the exhibit theme, “operating hours,” location and sponsor.Invite other classes to come through your exhibit to learn more about Clara Barton’s lifetime of service and our efforts to preserve her legacy. Name of Object How does this object relate to Clara Barton’s life of service? What can we learn about Clara Barton through this object? Is there anything special to note about this object regarding the way it is conserved? Do they address the questions asked in the activities when they finish their work? Do they understand how the objects reflect Clara Barton's lifetime of service and our effort to help preserve her memory? Are they using their curiosity and creativity to delve deeper into the material to make bigger connections? Read a Biography about the life of Clara Barton. Write a report about her life of service. Create your own First Aid kit using items from home. Do you collect at home? How do you care for your collection? Could you make an exhibit centered around your special items? The Clara Barton Needs You on-site Parks as Classrooms program is appropriate for 1- 3 grades. Students visiting Clara Barton National Historic Site learn how American Red Cross volunteers helped victims of natural disasters and war, and what it would have been like working with Clara Barton and living in her Glen Echo home. To reserve a program at Clara Barton National Historic Site, call 301-320-1410.